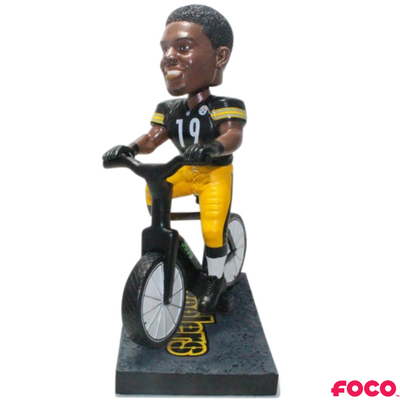 A limited edition bobblehead of Pittsburgh Steelers rookie JuJu Smith-Schuster was officially released last week featuring the former Poly High School wide receiver riding his bike. The National Bobblehead Hall of Fame and Museum unveiled the collectors’ item as a nod to a certain incident in the life of the NFL’s youngest player. Last year in October, JuJu posted a video of him walking to practice on social media with the explanation that someone had stolen his bike. Within 24 hours the bike was returned, a happy outcome considering he didn’t have a car, much less a driver’s license. This is the first bobblehead made of JuJu, produced exclusively for the National Bobblehead HOF and Museum by FOCO and are officially licensed. Each are individually numbered to 1,000, are in production and expected to ship in May, according to the announcement. The bobbleheads were $40 each during the pre order. Sklar told the Post the National Bobblehead Hall of Fame and Museum has something fun up their sleeves for a second version, but he can’t release any details yet. A JuJu bobblehead with the star athlete in his USC jersey is also in the works. JuJu was picked up by the Pittsburgh Steelers in the second round of the 2017 NFL Draft with the 62nd overall pick. When he made his NFL debut, he was the youngest player in the NFL. He finished his rookie season with 58 receptions for 917 yards and seven touchdowns, leading all rookies in yards and touchdowns, according to the release. During his three years at the University of Southern California (USC), Smith-Schuster tallied 3,092 receiving yards and 25 touchdowns. Before his college football career with USC, he played wide receiver and safety at Long Beach Poly High School. Learn more about the National Bobblehead Hall of Fame and Museum via the website here, Facebook page here and Twitter here.